When BOOKRIOT announced that William Faulkner was going to be featured in START HERE – their upcoming guide on how to “Read Your Way Into 25 Amazing Authors” it was as if someone had stabbed me in the heart repeatedly with the eraser side of a pencil. Just a little too close to home. Every reader has a favorite author – William Cuthbert Faulkner happens to be mine. Actually “obsession” would be more accurate. Good friends buy me copies of 1950’s pulps of his novels. I once spent the better part of a 5 hour ride to Pittsburgh debating his attitude towards race. I’ve had a surprising number of conversations in bars with complete strangers about Absalom, Absalom! and Go Down Moses. I also own not one, but two copies of Cleanth Brooks: William Faulkner The Yoknapatawpha Country. AND lastly, I’ve the bad habit of judgingany author writing in the English language based on how he holds up against the Duke of Oxford, Mississippi. Cormac McCarthy – Faulkner pimped. John Steinbeck – Faulkner’s more cheerful drinking buddy. Jeanette Winterson – Literary love child of William Faulkner & Gabriel Garcia Marquez. Alan Heathcock – Faulkner meets the Mid-West. David Foster Wallace – Obviously never read Faulkner. Karen Russell – Obviously did. I could do this all day (and have). ANYWAY! 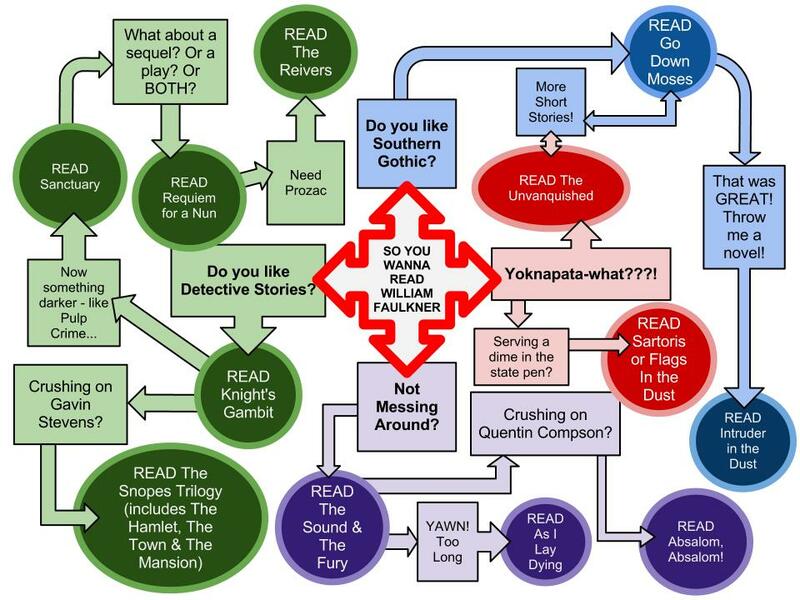 Am I going to waste your time with plot summaries? Family trees? Discussions of stream-of-conscious writing? Hell no! (That’s what Wikipedia is for). Instead I drew you a pretty picture. Below is my map of the backroads into Mr. William Faulkner’s Yoknapatawpha County. I’m entering Book Riot’s START HERE Write-In Giveaway… and here’s my entry. Previous post2012 Man Booker Longlist – Nothing to See Here! Wow. Just wow. Love it!! I can’t believe I missed your comment! I’m intrigued…. What, exactly, do you disagree with? Permission to use your map of the backroads of Yoknapatawpha County for an online class I’m taking. I really would love to share this with the class, but don’t want to do so without permission. Did I say how much I love the graphic? It is awesome! Please go ahead. And thank you so much for asking! 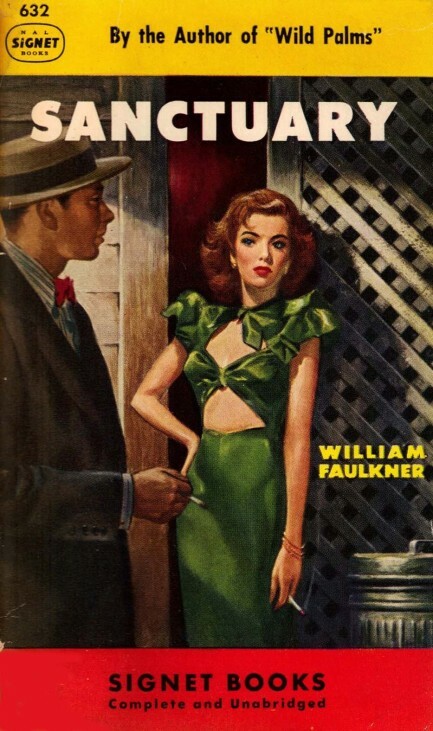 Is the class specifically focused on Faulkner or is he just one of many authors you’re studying? Actually, the class is about evaluating online classes and trying to make the expectations clear to a high school English student. I thought your graphic depicted the confusion that many of these kids feel trying to follow what the online course expects of them. And since it is a class, I wanted to get permission first. Thanks! No offense to the map – it is awesome if you are a reader of Faulkner (not too many high school kids are). Ahh, don’t sell high school-ers short – I read Sound & The Fury my junior year on my own (well, I actually approached a teacher to help me figure out what the heck was going on!). And who doesn’t love “A Rose for Emily”? 🙂 Good luck!